My whole living philosophy stems from life experiences, education, and my professional work as a registered dietitian nutritionist (RDN) and health coach. Living a healthy lifestyle was instilled in me from a young age. I remember getting my hands dirty in our garden and feeding chickens to help raise the food that comprised part of my family’s diet as well as participating in almost every sport offered in school. Back then, I guarantee I wouldn’t have thought about my choices as building blocks to a healthy lifestyle. I was simply doing things that made me feel energetic and alive so I could be and feel my best. Now, I have the opportunity to take what I have lived and learned through life, continued education, and my career to help people realize their absolute best mental and physical health. Focus on Naked Foods & Beverages: Choose whole foods and beverages that are as close to their original state as possible (e.g., fresh produce, nuts, seeds, beans and legumes, whole grains, eggs, fish, meat, dairy and water- organic, grass fed, free range, wild caught, and hormone free as able). If you are looking at the ingredients on a package and can’t pronounce items it probably isn’t a great choice. Try finding a healthier alternative or better yet make your own version from scratch! Eat in Moderation: With #1 said, I also believe that all foods can fit into a healthy diet. It is just a matter of deciding how much and how often you eat these foods so you can achieve your health goals. If you deprive yourself of your favorite foods and feel like you need to eat ‘perfectly’ you tend to revert back to old ways. Often, once we start eating a healthy diet and feel the mental and physical benefits our ‘favorite foods’ don’t sound as appealing anymore. Eat a Balanced Diet: Create a diet that balances the macro and micronutrients that your body needs to achieve its best health. 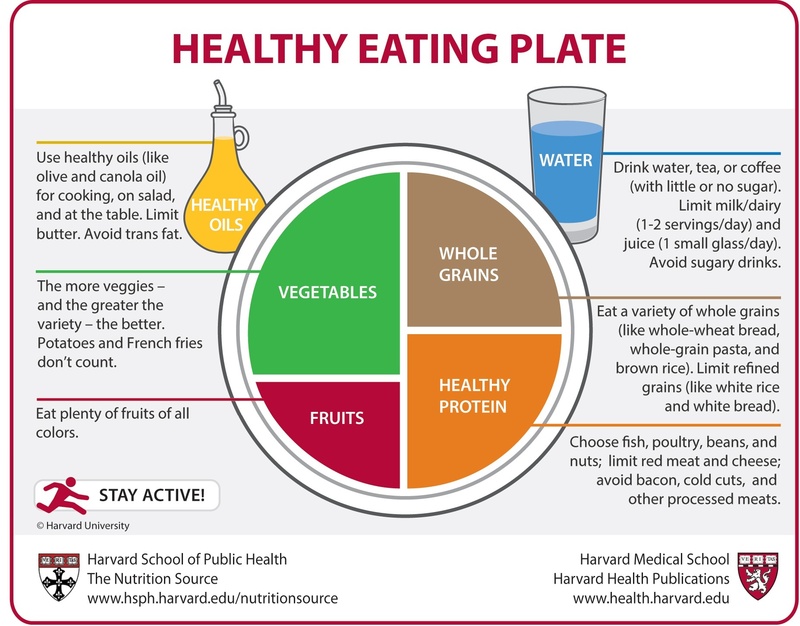 Harvard University has created a healthy eating plate that does a great job showing what this looks like. Eat on a Regular Basis: This might seem like a small detail but it impacts your diet in a big way. Eating at least every three to four hours encourages stable blood sugars, making healthy choices and eating in moderation. Eat Mindfully: Become aware of WHAT and WHY you are eating so you can make a CHOICE that is best for you; enjoying and being present to the process of eating and becoming aware of all your senses involved. Mindful eating also supports kicking the diet mentality to the curb and freeing your mind from feelings of guilt associated with food and instead connecting with the benefits healthy eating brings to your life. Finding what motivates you and making that part of your routine (enjoyment of the activity, having a workout buddy, training for an event, being on a team, etc.). Having the perspective that any exercise (even if it’s a short walk) is better than nothing- CONSISTENCY is the key! Manage Your Stress: Keeping your stress in check has a plethora of benefits: better immune function, reduced anxiety, more energy, feeling more relaxed and calm, better sleep, mood and digestion to name a few. Although it is difficult, try bringing awareness to and letting go of the stresses in your life that are beyond your control. Instead, focus on daily actions that bring joy, peace, calm and positivity to your life. Get Your Zzzz’s In: Without referencing scientific literature a majority of us know from experience that sleep has a major impact on how we feel, perform and look. According to the Harvard Division of Sleep Medicine has found that, ‘sleep plays a critical role in immune function, metabolism, memory, learning, and other vital functions’. Click here for your recommendation. Infuse PERMA into the Changes You are Making (Positive emotion, Engagement, Relationships, Meaning, and Achievement): Whether you are trying to include more produce in your diet or get more active research shows that including components of PERMA into behavior changes increases your overall wellbeing and the longevity of new habits.